Home > Google News > Misc Google > I Migrated My Google+ Account: Now What? I Migrated My Google+ Account: Now What? For the past 9 months or so, I've been living a lie. Well, I've been using a Ghost account on Google+ to share content. Two days ago, I am off that Ghost account and now living the good life, able to share content as myself instead as my alter ego. I signed up for Google+ when it launched under my Google Apps account which was a personal Gmail account for some reason. When I migrated my gmail account to a full fledge Google Apps account, my Google+ account went into limbo. I describe it all over here. Long story short, the only way for me to share stuff on Google+ was to either kill my already popular Google+ account, which was now a ghost account. Or have Google migrate it. Google told me in December they would migrate me, but 7 months later, I am not migrated and so can everyone else be migrated. A while back we announced plans for a tool that would help you transfer your circles from one Google+ account to another and ensure that your followers are automatically directed to your new, preferred profile. Today, anyone can visit Google Takeout and click “Transfer your Google+ connections to another account”: https://www.google.com/takeout. For more information, check out this help center article. Thanks again for being so patient! Here are details on how to migrate or transfer your connections. Technically, the only thing Google is moving over is circle names, circle members, "your circles" settings, and people and pages you've blocked or ignored. They are not migrating content, pages, and authorship information or verified status of your account. So my ghost account is currently still live at this URL but I am not active at this URL so follow me there. (1) The new account is not verified, but the old one is. Update: Google has verified my new account on the same day as me writing this. (2) My authorship in Google search results still links to my old account, even though I changed all my public URLs to the new URL over a week ago. Update: Google updated their index and should be fixed soon. Update: Google sent me instructions basically telling me when I see this screen, it thinks I am logged into my temp account. I had to create a new Gmail account to migrate this temp account to. It worked, I am finally off my temp account and using Google Apps fully. Those are my current issues after migrating. Note, I was unable to Share content on Google+, Add or remove people to and from circles or Block or ignore people until the migrating and transfer was complete, which took about 48 hours. 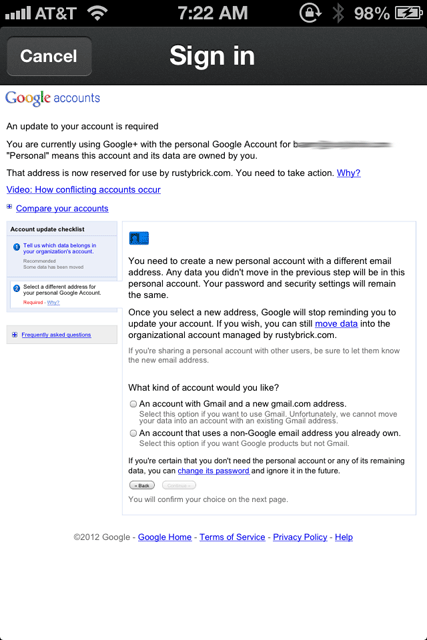 So that is my experience transferring my Google+ account details to my Google Apps account.